Native to South America, cocoa beans have been used in folk medicine to treat a variety of disorders -- including coughs and hair loss -- and as a source of nutrition. During processing, cocoa beans are roasted and fermented, then processed to remove their fat content, leaving the cocoa powder -- pure cocoa solids -- behind. Adding pure cocoa solids to your diet offers a range of benefits because it comes loaded with health-boosting minerals, fiber and phytonutrients. Eating pure cocoa helps you consume more magnesium and copper. These minerals activate enzymes your cells need to support your metabolism and make usable energy. Magnesium also maintains the health of your cell membranes, while copper helps you make melanin, a pigment found in your skin. 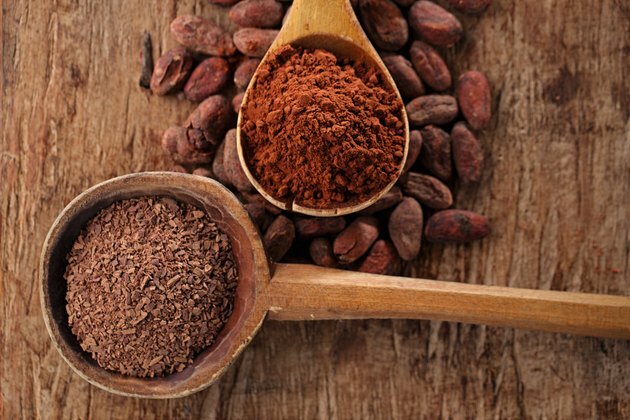 A 2-tablespoon portion of pure cocoa contains 409 micrograms of copper and 54 milligrams of magnesium. This makes up 45 percent of the copper intake the Institute of Medicine recommends daily, as well as 17 percent and 13 percent of the daily magnesium intakes suggested for women and men, respectively. Cook with pure cocoa, and you'll also up your phosphorus and iron intakes. A serving of cocoa solids contains 1.5 milligrams of iron and 79 milligrams of phosphorus. This makes up 11 percent of the phosphorus you need daily, according to the Institute of Medicine, along with 19 percent and 8 percent of the daily iron requirements set for men and women, respectively. The phosphorus in pure cocoa contributes to healthy bone tissue, makes up part of your cell membranes and promotes cell communication. Its iron content helps regulate your body's oxygen content because it allows you to sense low oxygen levels and helps your red blood cells provide your tissues with fresh oxygen. Pure cocoa also provides beneficial phytonutrients, called flavonoids, that benefit your nervous and cardiovascular systems. One type of flavonoids, called flavanols, supports healthy cognitive functioning -- learning, memory and critical thinking -- and helps improve blood flow in your brain, explains a review in "Neuroscience and Biobehavioral Reviews" in July 2013. An additional review, from the June 2013 issue of "Molecular Nutrition and Food Research," notes that other flavonoids promote blood vessel relaxation and protect your cardiovascular system from oxidative damage, which would otherwise contribute to heart disease. Pure cocoa has a rich flavor that works in a variety of dishes. Make a healthier version of hot chocolate by warming a mixture pure cocoa solids, nonfat dairy or almond milk and stevia -- or another low-calorie sweetener -- on the stove until warm. Add flavor by mixing in a few drops of peppermint, orange or raspberry extracts. Alternatively, add a few spoonfuls of cocoa solids to berry smoothies -- it pairs especially well with strawberries, raspberries and cherries. Finally, add a spoonful of cocoa solids to chilli. While a pairing of chocolate and chilli seems unconventional, cocoa adds depth and richness to the dish.